Recommended by US News and World Report’s Best of Business Section for Executives’ Nightstand. Trust makes us vulnerable which is why many find it difficult. When we trust others, we expect that we are safe with them. And it's not just money Americans have lost. 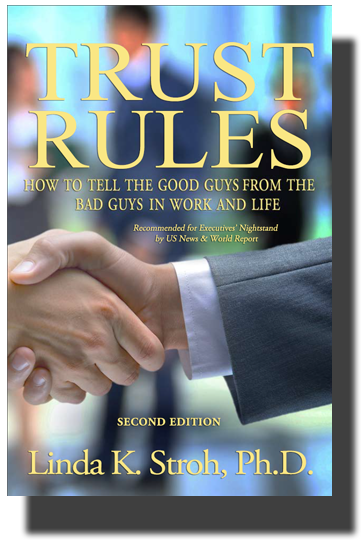 They need to recover from a betrayal of trust by financial and political leaders, says Linda Stroh, an organizational psychologist and author of Trust Rules. My research has shown me that a huge piece of living your best life is surrounding yourself with people who are trustworthy. LINDA K STROH is a Loyola University Faculty Scholar at the Graduate School of Business, Loyola University Chicago. Linda received her PhD in Human Development from Northwestern University; a post-doc in Organizational Behavior from Northwestern University's Kellogg Graduate School of Management, a BA from McGill University and an MA from Concordia University. Dr. Stroh's work has been cited in the Wall Street Journal, the New York Times, the Washington Post, USA Today, the Chicago Tribune, Fortune, Newsweek, U.S. News and World Report, and Business Week. 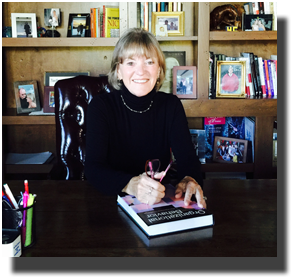 Professor Stroh's research has also been featured on NBC's Nightly News , CNN and Oprah & Friends XM Radio with Gayle King.